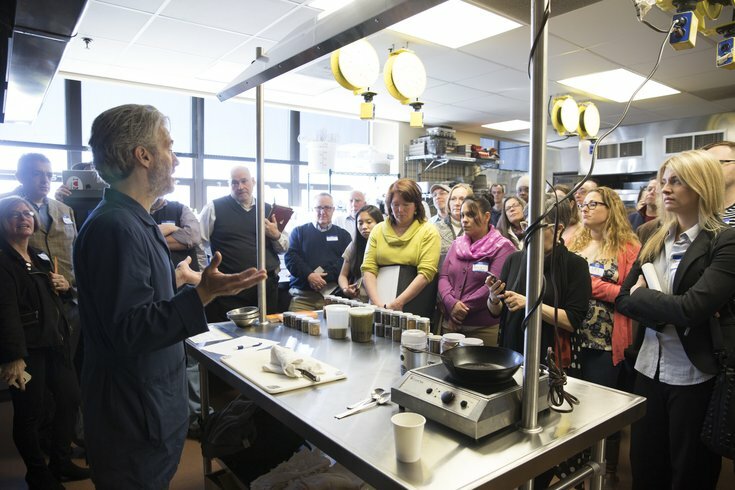 Lior Lev Sercarz presents "Variety Is the Spice of Life" at the 2016 Philly Chef Conference. The second day of the conference, with nuts-and-bolts topics like hospitality accounting and restaurant real estate, was industry-only. But anyone willing to buy a $20 ticket could attend the first day’s lecture program to hear experts discuss diverse subjects like food insecurity and the history of the cocktail. Highlights included renowned food science author Harold McGee as the keynote speaker and a demo by pastry chef/TV personality Johnny Iuzzini. On the beverage side, New York Times wine critic Eric Asimov led an afternoon wine tasting. Along with the national experts, many of Philly’s most successful chefs and restaurateurs shared their expertise during the sessions. On a panel focused on building a restaurant “dream team,” owners said that staffing issues are so significant that they inhibit business expansion. “The industry is growing, and the talent pool is struggling to keep up with it,” said CookNSolo’s Steve Cook. Dave Katz of fast-casual chain Honeygrow cited the influence of celebrity chef culture and young cooks’ unrealistic expectations, while audience members raised the issue of persistent low wages and poor quality of life. Moderator Alice Cheng of the Culinary Agents job site said that the problem is not unique to Philadelphia. “It’s more complicated than just a lack of qualified cooks. Culinary school grads and working professionals now have a variety of job options to choose from,” she said, such as working for purveyors and high-end grocers. “About 40 percent of all of the food produced is never consumed,” said lecturer Solomon Katz of the University of Pennsylvania, an authority on the anthropology of food. Fortunately, the folks at the Drexel Food Lab are working on innovative solutions to put a dent in the staggering amount of food waste and its environmental repercussions. The lab’s pilot program with Brown’s Super Stores examined how to best repurpose would-be discarded produce. For example, brown bananas were turned into ice cream that could be donated to shelters or sold to generate revenue. The lab also held a recipe contest for students to incorporate a dried vegetable blend made with excess food trim from Baldor Specialty Foods, a produce distributor. Mariana Chilton, director of Drexel’s Center for Hunger-Free Communities, discussed the prevalence of food insecurity and its devastating effects on small children and their families. This spring, the center will open EAT Café at 3820 Lancaster Ave., in conjunction with the Vetri Community Partnership and the West Philadelphia community. The name stands for “Everyone at the Table,” and the restaurant will provide welcoming and dignified service for all — those who overpay and those who cannot afford to pay for a meal. Organizers intend for it to serve as a hub for neighborhood collaboration and innovation. 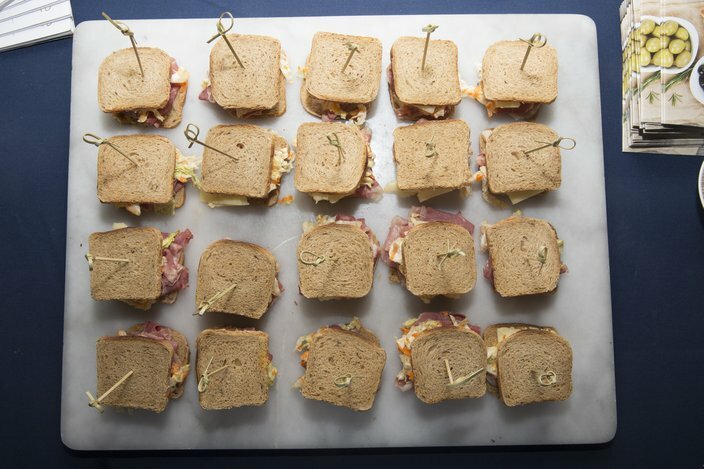 Sandwiches tempt attendees of the 2016 Philly Chef Conference. You wouldn’t expect to find a soggy boxed sandwich at a conference full of chefs of course, but the breakfast and lunch spreads really impressed this year, from a South Philly Barbacoa taco stand to 1732 Meats bacon to Weckerly’s ice cream to La Colombe draft lattes — not to mention the plates handed out in the demo cooking sessions. And what would wine lectures and cocktail lessons and experimental beer talks be without plenty of boozy samples?